The latest edition of The Royal Enfield Magazine brings us the sad news that Paul Carberry is finishing production of his 1000cc V-Twin Royal Enfields. I guess at $22,000 (or $15,000 plus a donor bike) the price point was too high to make this a viable proposition. Not to mention the complexities of reaching the most likely big markets, the UK and US, by a shop based in Australia. In fact, I had written to them inquiring how to get one in the US a few weeks ago and did not get a reply. Now we know why. It will be missed. Update: 3/27/15, Carberry has resumed production in India. It seems like such a simple idea, roping two Royal Enfield singles together into a V. As a clever idea, just doing it, even if roughly, might have been enough to sell some on the novelty and looks alone. It'd never be a match for modern motorcycles designed from the start as twins anyway. But Carberry seemed determined to do its job in a superior way in every regard and that is expensive. 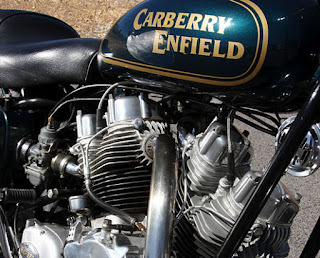 As the owner of a Carberry Enfield, I can say that these bikes are absolutely "bullet proof". Paul Carberry's meticulous construction has resulted in an engine which I suspect will give hundreds of thousands of kilometres of reliable service. All the Carberry bikes are individual and are spected to the owner's requirements. I understand Carberry Motorcycles is still a viable concern but disagreements between the principals of the company led to them stopping production despite having the makings of at least a couple more bikes. One hit the second hand market recently and I think it sold for approx A$27,000. I believe that another could come on the second market in the not too distant future. I would expect it to go for about A$30,000. They look right and attract a crowd whenever and where ever they stop. There were twelve production numbers and one prototype and two engines sold separately. IMO, @ $22,000.00 per, Paul Carberry was making $20 thousand per conversion, so he SHOULD quit his conversions. A metallic-substrate 3-D replicator could have made EXCELLENT ready to assemble engine/other parts, so beyond the first prototype, the Carberry-Enfield could have been priced 2 thousand dollars over the $6K of a new 500 R.E. Bullet. Whenever your unit is in the $22K - range (and its Not a Harley), units sold will be few, because only the 1%-ers of Brit-bike Collectors... can afford that price, so Paul never intended to move many, which makes me very angry. I'd be embarrassed to say I paid that much, unless its from the 1930s or a racing/other prototype. It'd be like what happens at the auctions. Why pay $50grand for an Austin Princess, even if it was rebuilt by a coach-maker like Barker or Mulliner (--made bodies for Rolls-Royce), because at the end of the day,--its still only a Austin. It is silly to claim that a 3D printer could produce even a minority of the parts necessary for production of this engine. This claim made is actually backward in the process. Non-operational prototyping could utilize parts made from a 3D printer, but even for a running prototype the 3D tech is not up to snuff, let alone for a unit that must withstand normal use. One is just coming up on 9th November 2015 at the Shannons Auction in Sydney. Engine No. 1. This will be the first time one has publicly hit the market. That is ridiculous! WHY wouldn't the MORONS organizing any "rally" have immediately-accessible ABC fire exstinguishers?!? And a metallic-substrate 3-D printer would be PERFECT for replication of ANY metallic motor part, as long as the method for replication involved triple-laser sintering. The "electron-method" is WORTHLESS for most 3-D projects, being responsible for porosity leading to TWO of Elon Musk's rocket explosions, imho. Anonymous of March 23 is ignorant of the FACT that many NASCAR & other racing teams routinely use metallic-substrate 3-D replicated parts in racing, and those parts are much more certain to last than regularly-machined parts. Penske is one of many teams that use 3-D metallics, and Penske hates to lose races, because losing races makes finding sponsors problamatic. Jeez. I'm building a musket 998 right now. It's a lot easier to be critical of someone else than it is to dig in and build something. D-uh; for almost 15 lakhs, the Triumph Thunderbird is a better option.